The dark Universe is filled with shining galaxies. Galaxies shine in virtue of their stellar content and the emitted radiation reaches us from the most remote regions of the Universe. Stellar radiation can be modelled following robust physical principles, the light emitted by galaxies can be used as a probe of structure formation and evolution in the Universe and as a cosmic chronometer. A galaxy contains million to billion stars. The total energetics emission of a galaxy is the sum of the light from all stars, which in turn depend at first on stellar energetics, lifetimes and the stellar initial mass function. It also depends on parameters that are specific of the different galaxies, such as history of star formation, chemical composition and dust content. 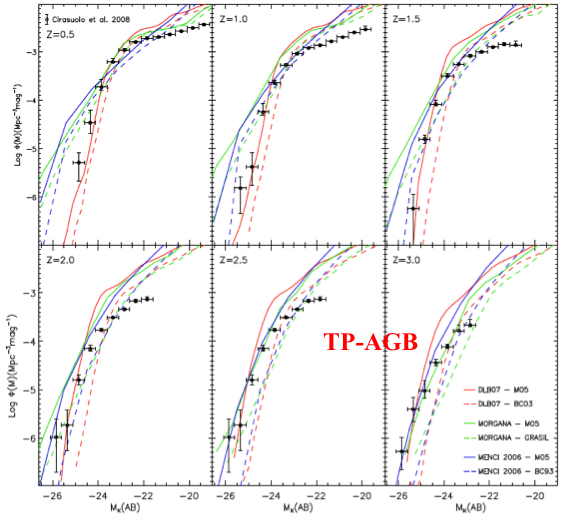 Theoretical spectral energy distribution of a model galaxy half billion years old with solar metallicity. From . Stellar population models rely on the physics of stellar interiors and atmospheres, and analytical prescriptions for the star formation rate, and provide the integrated properties, in particular the Spectral Energy Distribution (SED), of model galaxies as a function of physical parameters, e.g. 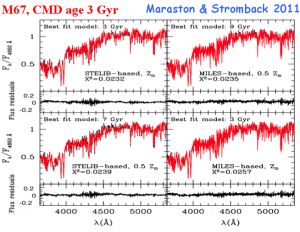 time, star formation history, chemical composition. Stellar population models are central to analysis in astrophysics and cosmology hence their use is widespread. In particular, they are the key tool for studying Galaxy Formation and Evolution. 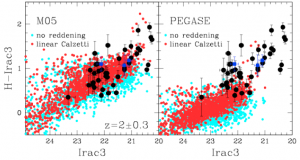 2. the account of non-solar element ratios in the model spectral lines [3,4], which has allowed to understand the formation timescales of elliptical galaxies . Recent results include he calculation and analysis of models at high spectral resolution . 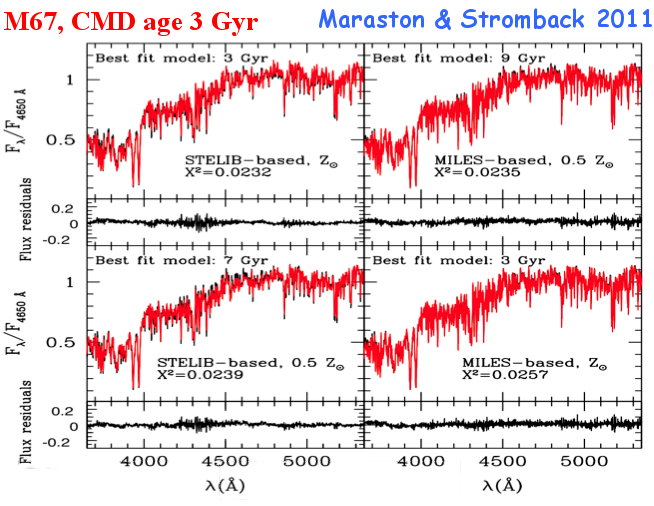 The figure shows how well the models fit real stellar populations. These models meet the advancements in new instrumentations and galaxy surveys, such as MaNGA. High spectral resolution model fit (red) to real stellar populations (black). From . Stellar population models are also a key ingredient of Galaxy Formation and Evolution models. A team led by ICG researcher Claudia Maraston was the first to explore the effect of stellar population models on the properties of galaxy models in a Cold Dark Matter Universe [7,8]. 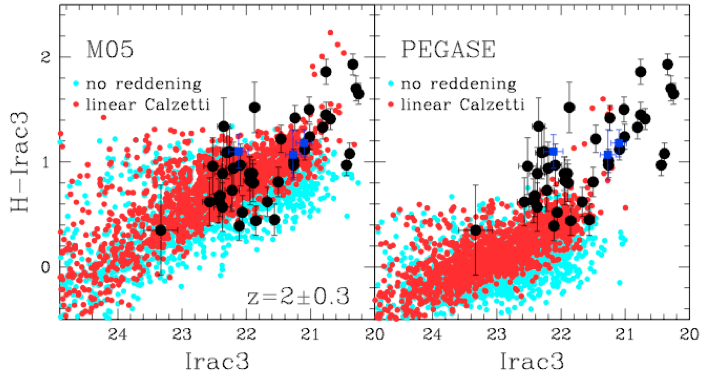 Effect of input stellar population model on the comparison between galaxy data (black points) and galaxy evolution models (red points). The models by Maraston (2005, left-hand panel) allow for a better match between real distant galaxies and galaxy evolution models. From . The models are available at: www.maraston.eu and http://www.icg.port.ac.uk/~thomasd/. 8. Henriques, Maraston et al. 2011.